Tau Game Lodge is a family-friendly luxury safari lodge enjoying a spectacular waterside setting within the malaria-free Madikwe Game Reserve in North-West province. Tau has its home in Groot Marico, a breathtaking area of hills and ancient mountains. At the main lodge, a comfy lounge, bar and dining area – partially open-air – overlook a waterhole. Thirty thatched chalets stand at the edge of a bird-populated pan, with private sundecks from which to watch the comings and goings of animals. 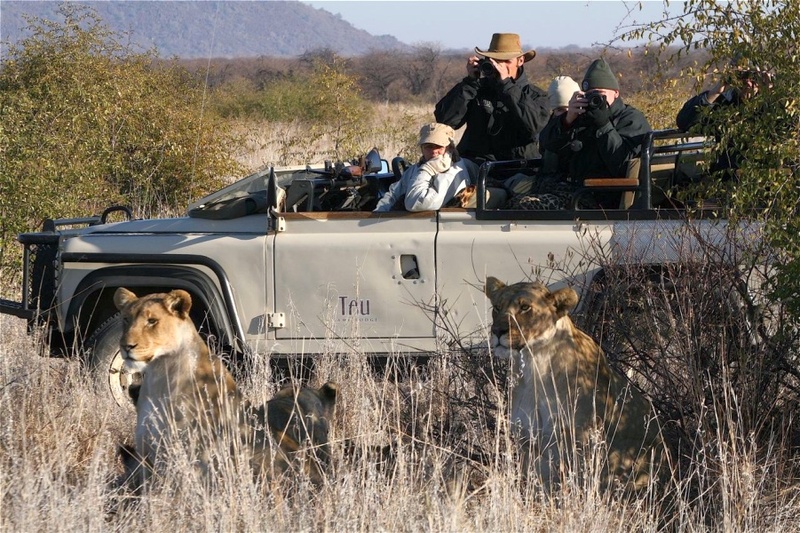 Tau offers daily safaris on Big Five turf, as well as a well-tailored children’s programme, an African Spa Oasis, a stylish conference venue and wedding facilities. The lodge accommodates up to 60 guests. There's currently no specials at Tau Game Lodge. Accomodation, three meals, 2 game drives per day. Tau Game Lodge has a modern conference centre made up of three halls, which can used singly or together. The centre has its own kitchen, bar, lapa and cloakroom facilities, and is equipped for specialist conferencing. Breakaway rooms are also available. Tau offers various teambuilding activities in the reserve.